The Greek Period of art is still considered a golden age of ancient art. The Greeks were known for their sculptures. 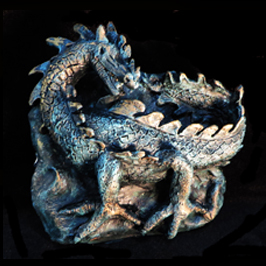 They created both relief sculptures and bronze sculptures. These ancient sculptures are corroded because they are very old. Join Sharon Hofer as she teaches students to create a relief sculpture and then paint it to make it look like an ancient Greek sculpture. Students everywhere will enjoy creating one of the favorite characters of Greek mythology – the dragon! The Mythical Dragon project is a Level 3 in difficulty.